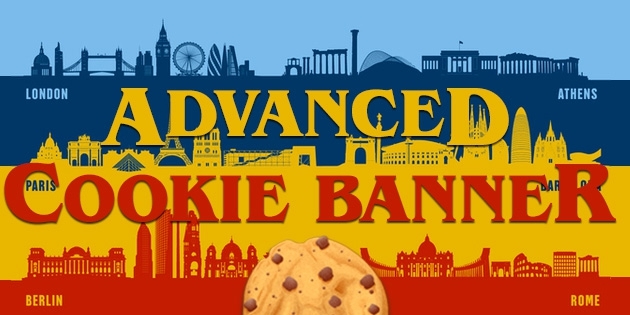 Advanced Cookie Banner is the ONLY module allowing you to put your shop in compliance with the EU's rules and Google's rules relative to the usage of interstitials. I don't know about you, but I think that the mobile navigation experience has worsened dramatically since the appearance of these banners. They aren't easy to close, and are taking a huge part of the screen. As you will have guessed, I do not put up with them anymore, and Google's engineers too apparently. Did you knew that from January 2017, Google will penalize the SEO of all the website that are using intrusive and not required interstitials. I invite you to read these rules so you can check if your website is compliant. You will find an example of what an cookie acceptation interstitial should look like. I find this example very interesting, as it offers a clear presentation and offers an action which is very accessible thanks to its big "Accept" button. Even while walking, smartphone in hand, it isn't necessary anymore to aim for the little closing cross, or the little bottom-right button, which is making your browser's interface appear when trying to click on it. Starting from this principle, we wished to offer an ergonomic approach, displaying a clear message, already translated in 24 languages. Advanced Cookie Banner will display the traditional warning message, in the form of a banner, or an interstitial using an authorized format for mobiles, but will also block the modules wanting to create cookies on the devices of your visitors until they have given their consent. Behind this "Modules using cookies Blocker" feature, there is a technical challenge. Actually, all the modules offering this fonctionnaly have chosen the easiest way, which is to modify your PrestaShop's default behaviour by installing an override. It is very known from the experimented PrestaShop's users that overrides can create more issues that the solution they are supposed to bring you. Prevents the selected modules from creating cookies during the first visit on your shop. Allows to add a link to a CMS Page giving more information about the usage of the data stored in the cookies. Other pages consultation isn't considered as user's consent, so the blockage will continue. We decline any responsability in case of wrong configuration of the module, or if you forget to block modules that are using cookies to collect personal data.